A great shoe can pull off any outfit, and a great shoe favor can pull off any party! Our exquisite high heel bottle openers are the perfect shoe favor to show your guests you appreciate them and that you never crimp on style! 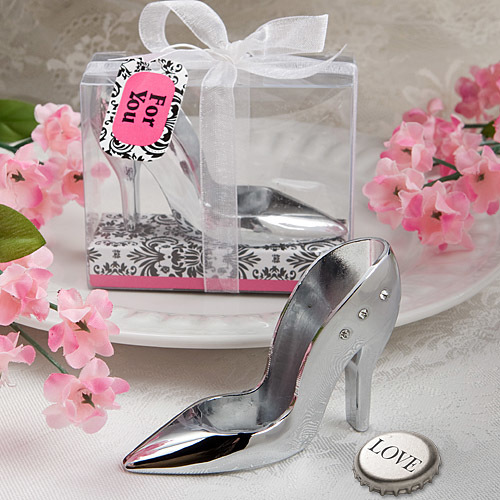 Crafted with a durable chrome finishing and measuring 3” long x 1-3/4” tall and 1” wide, this silver rhinestone studded high heel bottle opener comes packaged in a translucent acetate box delicately tied with a white organza ribbon and set atop a pink bordered white and black damask designed platform. You know your girls love high-end style and these high heel bottle openers are the ideal way to show your love and to keep the memories of the event alive. Every time they use their rhinestone studded chrome high heel bottle opener, they will think of you and the great fun they had at your celebration!